Although his presidency was marred by scandal after his death, Warren Harding was a popular president in his day. Even as a young boy Harding avoided conflict in order to please his peers. That habit caught up with him when he became president. Before he got into politics Harding was a successful businessman who bought a bankrupt newspaper and made it profitable. His wife Florence served as his business partner. He called her “The Duchess” and feared rather than loved her. Their complex relationship pushed him into politics. His new profession allowed him to be away for long periods. It also enabled him to have affairs with other women. He had a magnetic personality and a great speaking voice. During the Republican national convention in 1920, the party could not decide on a candidate. Party leaders looked for a compromise, so they asked Harding if there was any reason they shouldn’t nominate him. Though he didn’t actually want to be president, Harding told them there was nothing in his past that would prevent him from running. In the first presidential election in which women could vote, Harding won. 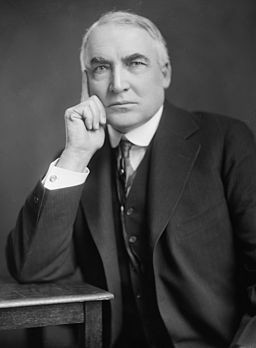 Harding promised voters that his presidency would mark a return to “normalcy,” or to the days before World War I. Fortunately the country didn’t face any major crisis during his presidency. Unlike President Wilson who always thought his opinion was the right one, Harding was indecisive. After listening to both sides of an issue he often thought that each side was just as right as the other. Even Harding admitted that he was in over his head as president. Later historians would agree with him when he remarked, “I never should have been here.” Still, Harding remained a popular president until he died of food poisoning during his third year in office. After his death rumors about his private life and corruption in his cabinet came out. Harding had always been a womanizer, and one woman claimed he had fathered an illegitimate son. His desire to be popular had caused him to cover up rather than publicize the scandals that plagued his administration. An illegal oil-rigging scheme led to the eventual arrest of his former secretary of the interior. It was the first time a cabinet member had been convicted of a crime. Ironically, the president who wanted to be loved by everyone became one of the country’s least respected presidents. I was planning to do my series of blog posts on the presidents in chronological order, but as President Harding’s personal affairs have been making headlines lately I decided to move him up. Before he got into politics Harding was a successful businessman who bought a bankrupt newspaper and made it profitable. His wife Florence served as his business partner. He called her “The Duchess” and feared rather than loved her. Their complex relationship pushed him into politics. His new profession allowed him to be away for long periods; it also enabled him to have affairs with other women. Perhaps the photographs don’t do him justice because women seemed to think he was very attractive. He did possess a magnetic personality and a great speaking voice. Harding promised voters that his presidency would mark a return to “normalcy,” or to the days before the war. Fortunately the country didn’t face any major crisis during his presidency. Unlike President Wilson who always thought his opinion was the right one, Harding was indecisive. After listening to both sides of an issue he often thought that each side was just as right as the other. Even Harding admitted that he was in over his head as president. Later historians would agree with him when he remarked, “I never should have been here.” Still, Harding remained a popular president until he died of food poisoning during his third year in office. After his death rumors about his private life and corruption in his cabinet came out. Harding had always been a womanizer, and one woman claimed he had fathered an illegitimate son. Recent DNA evidence revealed he had an illegitimate daughter named Elizabeth Ann with his mistress Nan Britton. His desire to be popular had caused him to cover up rather than publicize the scandals that plagued his administration. An illegal oil-rigging scheme led to the eventual arrest of his former secretary of the interior. It was the first time a cabinet member had been convicted of a crime. Ironically, the president who wanted to be loved by everyone became one of the country’s least respected presidents. When the U.S. joined forces with Britain and France against Germany and Austria-Hungary in 1917, it had a small army. Unable to get volunteers to fight in World War I, President Woodrow Wilson instituted the draft so that the army would have more soldiers. In July, a drawing was held to determine which men would go to the warfront. By the end of the day, over 1 million men were chosen to fight. Despite being the largest army in American history, the new recruits didn’t know much about twentieth century warfare. New technology led to a new kind of warfare during World War I. During the Civil War, hundreds of men charged toward the enemy in battle. The invention of the quick firing machine gun made traditional warfare impossible. With the use of machine guns, the charging soldiers died within minutes. In order to defend themselves against these weapons, the European armies dug trenches, or holes in the ground, to defend the territory they gained. The trenches got so big that they accommodated both the armies and their supplies. When U.S. soldiers arrived, however, they quickly learned that the trenches and new equipment that were supposed to protect them from bullets also caused problems. Living in the dirt of the trenches made it impossible for soldiers to keep clean. Without regular baths, disease spread through the army. Parasites, referred to as “the cootie” by soldiers, caused fevers. One soldier described the parasite, “The vermin were about the size and color of small grains until they would gorge themselves on the blood of their victims…It was a standing joke that there was no point in scratching since the little buggers had legs on both sides.” Unsurprisingly, seventy percent of the time that soldiers spent off duty was caused by illness. Another hazard for World War I soldiers on both sides was the invention of mustard gas, a poison chemical fired in a shell at the enemy. It was called mustard gas because of its scent. Exposure to mustard gas produced blisters on the skin and lungs. A nurse described the suffering of these soldiers, “[they were] burnt and blistered all over with great mustard-colored blisters, with blind eyes, all sticky and stuck together, and always fighting for breath.” Soldiers exposed to mustard gas often became blind or died. In addition to being shot at or gassed, soldiers also died by getting stuck in mud. Much of the western front in France was low-lying land, and rain turned the trenches into pools of mud. Wounded soldiers fell into the mud and drowned. Soldiers also got “trench foot” by standing in the water for hours or days. The soldier’s toes numbed and his foot rotted. To save the soldier’s life, medics amputated, meaning cut off, the foot.